I picked this little set up at IMATS (I gave up on the collective haul post – they’ll be coming at you one by one I’m afraid!) from Guru Makeup Emporium who were offering a very decent discount! 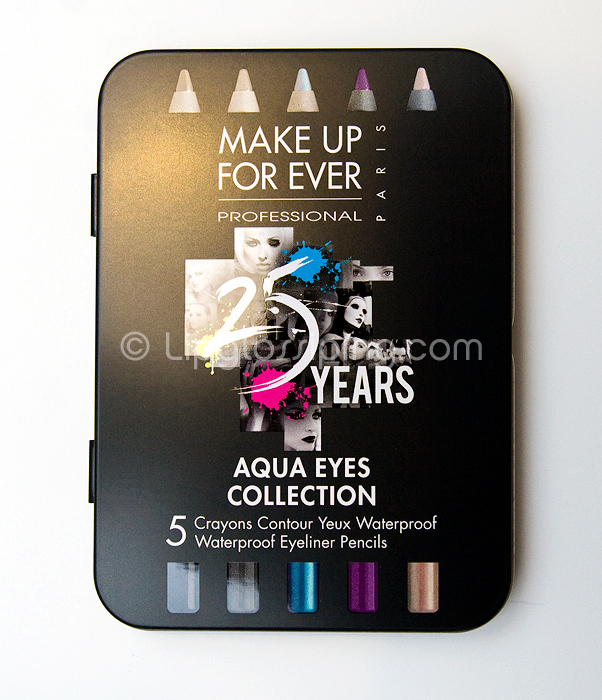 5 mini versions of the very popular Aqua Eyes Pencils housed in a litle collector’s tin. Colours included are: Matte Black (0L), Pearly Brown (2L), Blue with Green Highlights (12L), Shimmering Plum (4L) and Champagne (23L). The pencils are heavily pigmented and apply smoothly on the waterline. The champagne will make a lovely eye-brightener, and the blue is simply to die for. They don’t budge from my lashline and sick to the waterline for a good few hours. Do you wear coloured pencils? I paid £10 for the set. MUFE Aqua Eyes Pencils retail in the UK for around £11.95 each. They look lovely! I definitely need to get myself some more eyeliners! yup, i just adore my green eyeliner pencil from The Body Shop. i think the packaging for the product is very sleek. maybe am gonna purchase this. wow that is a bargain! Very pretty, and what a bloody bargain!! @sparkle and shade – you’re too kind (and very welcome!) – I only wore black too for so many years, I love blue especially nowadays, it goes so well to add a pop of colour to an otherwise neutral eye, especially if it’s a more golden neutral! @SparklzandShine – I think the blue is my fav too! @Claire – Thanks for the hint about using them as a base, I just never think to do that – I’ll try it! @SilhouetteScreams – LOL, I’ve seen that set, crazy! All makeup is insanely expensive in AUS isn’t it? @Shifa – I know! They weren’t selling many… I think they only had about 20 sets out on the table. I was in the righ place at the right time for once. 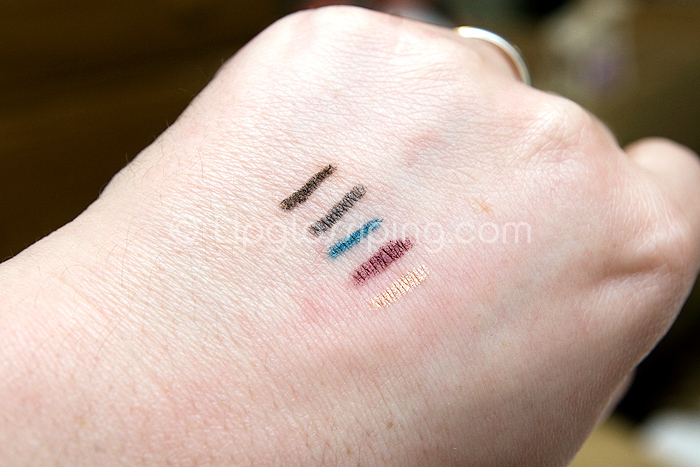 @Nicola – Have you tried any of the GOSH or Urban Decay liners? @RedTiger21 – About time I got a bargain!